[American Thinker] Less than a week after 49 Egyptian Christians were massacred in two bombings in Alexandria and Tanta during Palm Sunday mass, Venezuela's socialist thugs stormed a Wednesday Holy Week mass, assaulting the presiding archbishop of Caracas, the church's worshippers and trashing and looting the church. The attack wasn't on the same level as the terrorist bombing, but it signaled an emboldened and increasingly violent state, which may well have been drawing inspiration from the horror in Egypt. Communism: the other religion of peace. The archbishop in question, Cardinal Jorge Urosa Sabino, was no ordinary archbishop. For years he has blasted the horrors of Venezuela's chavismo for leaving the poor more impoverished and hungry than ever, even as it purports to speak in its name. He's denounced dictatorship and warned of its ascent in the country. Along with many archbishops, he's tried to warn Pope Francis that materialistic communism is an unmitigated disaster for the country. 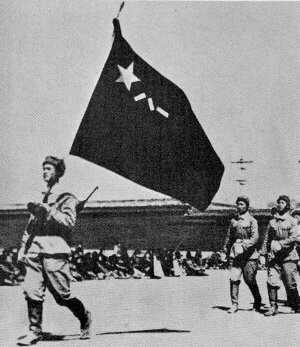 (Beijing) The Chinese Communist Party wants a "second Cultural Revolution, to decimate the religions". The municipality of Zhumadian in Henan Province has ruled in favor of the Protestant Church of Beitou. The church was demolished on April 14 on behalf of the authorities. It was where the wife of the pastor Ding Cumei, was killed, when she and her husband desperately tried to prevent the anti-Christian vandalism. The woman had been thrust into a pit and buried alive under the rubble. The corpse of the woman was laid out by the Christians next to the ruined church. The authorities had caused the demolition of the church, because it is located where there is a shopping center to be built. For two years China's communists have turned against Christians in the country. What is officially called "urban cleansing" and "economic improvement", is in reality, a targeted campaign against Christianity, whose rapid spread is a concern to the communist government. The anti-Christian demolitions affect mainly the provinces of Zhejiang, Henan, Hebei and Hubei. Three weeks after the death of Ding Cumei, the city council ruled in favor of the the ministry couple. The Christians could keep the land, and it will not be reallocated in a commercial zone. The death of the Pastor's wife had evidently aroused too much international attention. The authorities are trying to limit the damage. For Ding Cumei, however, the authorities are too late. Pastor Li Jiangong now fears that the murderer of his wife will not be charged and everything could be covered up. On April 14, the Church of Beitou was destroyed. The day before, a church was demolished in Wenzhou, "because the cross on the roof was too high" as ChinaAid reported. In a few minutes, property valued at three million yuan had been destroyed (approximately 400,000 euros), which amount had been donated over several years by the faithful for the church. In Hebei Province, the situation is no less dramatic. Last month, five underground Catholic priests were disappeared there. At present there isn't any sign of life from them. The faithful believe that they were arrested by police and taken to a prison or a re-education camp. The Chinese Communist Party appears unwilling to tolerate the Christian religion. 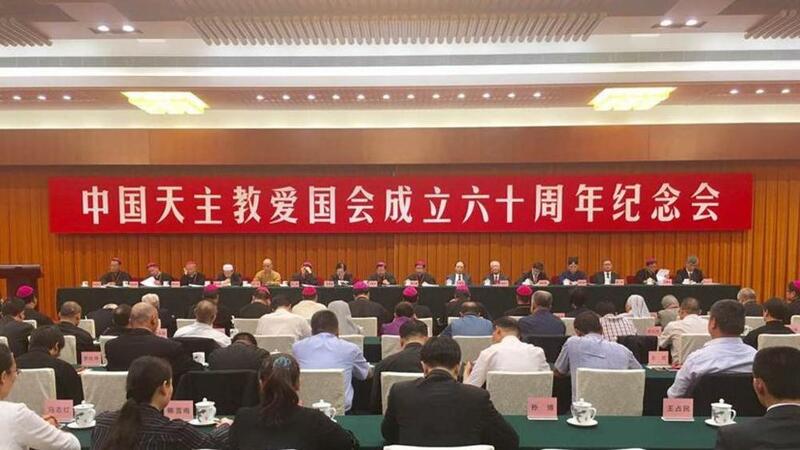 Last 22-23 April, the highest ranking meeting in 15 years was held in Beijing on religion. Not a good sign for Christians. The meeting involved the participation of state and party leader Xi Jinping and included the members of the entire Standing Committee of the Politburo, in short, the CP members who really run the country. The meeting took place behind closed doors. The sparse information announced by the official press does not bode well. State and party leader Xi Jinping stressed that the question of religion is closely connected "with state security and national unity". Therefore, it is "essential" that religious communities "mix their teachings with Chinese culture, obey Chinese laws and all of the reform of China and the prescribed socialist modernization to contribute to the achievement of the Chinese dream." Xi Jinping called for "Sinicization of religions" and its subordination to the Communist Party, "to strengthen the position of the party"
"Party members have to practice no religion but to be Marxist atheists"
At the same time Xi Jinping warned all party members not to practice a religion. "You do not have to search for their values ​​and their faith in religions, but have to remain Marxist atheists with firmness". Finally he criticized "foreign forces", accusing, "to seek to influence the religion in China". The latter point was directed without direct mention especially against the Vatican and the Catholic Church. The Holy See has been trying for two years without success to reach an agreement with Beijing to improve the lives of the Chinese Catholics. John Mok Wai Chit from the Chinese University of Hong Kong confirmed AsiaNews' statements of Yi Jinping. The state and party leader had "stayed in all clarity that there had to be no religious activity outside of party control." The "leading role of the party must be enforced on all religions". There could be no doubt in the reading of these explanations says John Mok Chit Wai: "I think it's pretty clear that Xi has no intention of entering into any compromise with religious groups. But on the contrary. Xi has made it clear that there can be no compromise. The party has to stand above other religions "
The Chinese Lawyer Sang Pu from Hong Kong, sees it no differently: "With this speech, the Communist Party has dropped the moderate mask that had been her created by Deng Xiaoping, Jiang Zemin and Hu Jintao [the three successors of Mao Zedong] . "Xi is preparing a" second cultural Revolution "in order to decimate all religions," said Sang Pu. "To my knowledge, no one here in Hong Kong sees the speech by Xi as good news." (Caracas) More new blooms drive Venezuela's Chavism . 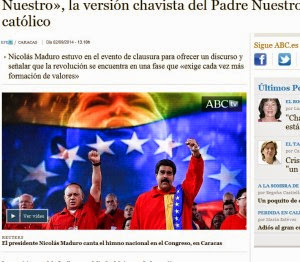 This includes the most recent anti-Christian provocation: President Nicolas Maduro made a partisan statement, in the future the new "revolutionary" Our Father "Chavez Nuestro" prayer in honor of the deceased predecessor Hugo Chavez. Chavism is named after the late president and revolutionary leader Hugo Chavez (2013) by the Venezuelan government since he wanted to implement a Bolivarian Revolution after their 1999 acquisition of power. The reigning president since 2011, Nicolas Maduro of the United Socialist Party of Venezuela (PSUV) bases his power on the state-sponsored cult of personality around his predecessor ,Chavez. The presidential elections in April 2013 Maduro had won with a wafer thin 50.66 percent of the vote for himself. During an internal training session for party functionaries of the ruling PSUV, the Chavisten were encouraged by Maduro, to continue to pray a socialist version of the Our ​​Father. It was written in honor of the deceased late President Hugo Chavez as reported by the Venezuelan television channel Globovision on Monday. "Our Chavez will in heaven and on earth, in the seas and in us, the delegates, hallowed be thy name.Your heritage come to bring it to the people here and everywhere, give us your light today, so you lead us every day and lead us not into the temptation of capitalism, but deliver us from the evil of the oligarchy and the crime of smuggling, for we are the country, the peace and the life, eternity, Amen. Viva Chavez!" President Maduro took the "revolutionary" step so that the "Revolution is in a phase that requires to reinforce the value of education... The Venezuelans should be fortified for daily street fighting for the values ​​of the revolutionary leader Hugo Chavez," said Maduro in his address at the end of the event. Hugo Chavez had a very difficult relationship with the Catholic Church and also did not hesitate to let his followers storm the Archbishop's Palace in Caracas. His affiliation with the Catholic Church was still clear. The religion of his successor Maduro however is unclear. The son of a Jewish-born father and a Catholic mother was, as the President himself declared, "socialist educated." Maduro himself has made anti-Catholic as well as anti-Semitic statements and is a supporter of the Indian guru Sathya Sai Baba, who is deceased since 2011. The video shows the party meeting at which the "prayer of the Chavista delegates" was first presented. MARYKNOLL, N.Y., Aug. 1, 2014 /Christian Newswire/ -- The Vatican has issued a decree that lifts its 29-year suspension on Father Miguel F. d'Escoto Brockmann, a Maryknoll priest. The Maryknoll Fathers and Brothers is the mission society of the U.S. Catholic Church. Father d'Escoto, 81, was ordained a Roman Catholic priest on June 10, 1961. He helped found Orbis Books, the theological publication division of Maryknoll, and he was an official with the World Council of Churches. During the 1970s, Father d'Escoto became engaged in politics in Nicaragua. He joined the Sandinista National Liberation Front, a political party that overthrew Anastasio Somoza Debayle and established a revolutionary government. For his political actions, involvement in the Sandinista government and failing to resign from a political office (Nicaragua foreign minister) held in violation of his ministry, Father d'Escoto was suspended from his priestly duties by the Vatican. [SCMP, Hong Kong] Cardinal Joseph Zen Ze-kiun, Hong Kong’s outspoken former bishop, has asked Pope Francis not to visit China, saying the pontiff would be “manipulated”. Improving ties between the Vatican and Beijing has given rise to speculation the pope could reach out to China. “The few courageous [Catholics] could not meet [the Pope], and the Communist Party would show him the illegitimate bishops, including the three excommunicated ones,” the 82-year-old said in the interview. The comments come as ties between the Vatican and China have improved in the early days of the pontificate of Francis. When he rose to the helm of the Catholic Church last year, the Chinese Ministry of Foreign Affairs congratulated Francis on his election. In an interview in March, also with the Corriere, the pope said he had exchanged letters with Chinese President Xi Jinping. The Vatican and China have not had formal talks since Beijing severed ties 63 ago over allegations of espionage. Informal talks were last known to be held in 2010. Yet Beijing’s unsanctioned ordination of bishops in 2010 and the house arrest of Thaddeus Ma Daqin, the outspoken auxiliary bishop of Shanghai, two years later have soured ties. Ma, who gained widespread popularity by publicly resigning from the state-sponsored Chinese Catholic Patriotic Association, has since been under de-facto house arrest at the Sheshan Seminary in the city’s Shanghai’s outskirts. Only one public appearance has been reported, in October 2013. Since January, authorities in Zhejiang province have demanded Christian communities to take down crosses from their churches or else these would be demolished. Hundreds of churches or crosses have so far been torn down in the province under the campaign, which local officials say only targets structures that violate building codes. (Saigon) Persecuted by the communist regime, he used the chains that robbed him of freedom to pray the rosary. Nguyen Huu Cau converted to Christ in prison. A few days ago he was released after more than 37 years in prison and a prison camp. "In 1986, I was baptized at the Easter Vigil by the Jesuit Joseph Nguyen". Cau described in an interview with Catholic News the hard fate of Vietnamese Catholics. The Jesuit priest was the one who told him about Christ in custody and taught him the catechism. Since then, "I have prayed the Rosary every day seven times and Stations of the Cross five times," said Nguyen Huu Cau-. After futile attempts reeducation, Cau was released last 22 March. 32 years spent as the "enemy of the people" in prison and more than five years in a concentration camp. After his release, he said: "I thank God that He has forgiven my jailers." 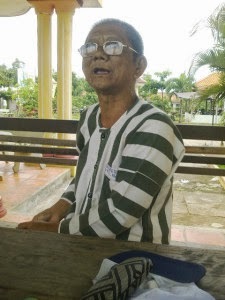 Due to severe torture during his detention, Nguyen Huu Cau-is now deaf and almost blind. "In prison, I've gotten to know Christ and found to faith." Cau was born in 1947. He served in the South Vietnamese army and became a captain. As such, he fought against the Communists of North Vietnam and the South Vietnamese Communists. When the Communists won in 1975, he was arrested and disappeared for several years in a concentration camp. In 1980 he was released from the camp, but in 1982 re-arrested because he had made hints on manuscripts of his poetry, that could have been criticism of the Communist regime. In 1983 he was convicted of "sabotage" and damage to the reputation of the party and sentenced by the government as "an enemy of the people" to death. Later the sentence was commuted to life imprisonment. For 32 years Cau had been in the prison camp Z30A K2 in the middle of the jungle. He wrote more than 500 letters to the Communist regime and called for the resumption of his trial. He never received a response. On 22 March 2014 he was released from prison 39 years after his first arrest. The release was due to an amnesty granted by Vietnam's State President Truong Tan Sang because of the precarious health of Nguyen Huu Cau-. Cau prayed the Rosary "on the chain to which I was chained. It had 90 rings. I have made from the chain that took my freedom, my own personal rosary. From Father Joseph Nguyen Cong Doan, who was himself a prisoner, "I got to know the love of God. So I could even compose a song that is dedicated to the Holy Cross, which has carried me in an earthly captivity." Father Nguyen works today at the Pontifical Biblical Institute in Jerusalem. Before his conversion, Nguyen-Huu Cau kept his hatred against the Communist regime and against his tormentors alive. He hoped someday to be able to take revenge for what they did to him. Several times he thought at the time of suicide to escape captivity. "But the love of God and the Blessed Mother have changed me. I feel no hatred more for my tormentors. The Holy Trinity and Mary helped me to overcome my strife with my fate. Have prevented me from being killed while in custody all these years. " 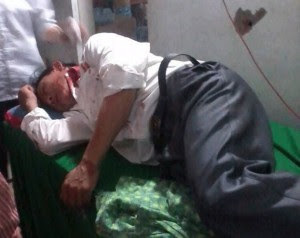 (Hanoi) The Vietnamese police attacked a peaceful rally of Catholics in the parish of My yen. With batons, electric pulse weapons, tear gas and shots in the air with live ammunition, the Vietnamese police took action against several hundred Catholics who were demonstrating for the release of two parishioners. The two Catholics are in prison without charge since June. According to witnesses, it was one of the bloodiest and most brutal of anti-Christian police actions in recent years. Several dozen Catholics were arrested. The number of injured is much higher. The seriously injured were taken to Hanoi. Several of them are in serious condition. My Yen is in the province of Nghe An, a coastal area in the central north of the country. Radio Free Asia reported, the police appeared in front of the parish church of My Yen firing warning shots to disperse and to intimidate the Catholics. As they would not retreat, "the police came beating with batons and electric batons on the demonstrators." One of the Redemptorist affiliated websites has published numerous photos of some of critically injured Catholics. Many have head injuries. According to witnesses, about 3,000 police officers and soldiers had been used against the Catholics. Doctors were prevented from coming to the aid of the injured. The two Catholics, Ngo Van Khoi and Nguyen Van Hai had been arrested in June by a special command of the security forces. Since then they are in detention, without officially being charged of a crime. The families were initially told that they were for "disturbing public order" and in security custody. >Since this "disorder" is said to have taken place, it has not been clarified. Vietnam has resisted demands for religious freedom and continued repression. The security forces take action against bloggers, dissidents and human rights activists who are calling for the right to religious freedom. In 2013 more than 40 human rights activists have been arrested for "crimes against the state". The arrests are made on the basis of a provision that classifies general and vague human rights groups as "subversive". In January, 14 were Vietnamese, including several Catholics, were sentenced to long prison terms on charges of "attempting to overthrow the government. A judgment that has been branded by many human rights organizations as political despotism. [Colombia] The terrorists of the FARC, its leaders, Piedad Córdoba, Ivan Cepeda and their allies at Alvear Restrepo Lawyers Collective [Like the SPLC or the ACLU but even worse] , these murderers and thieves have now committed an act of barbarism yet again for the admiration and support of the FARC. 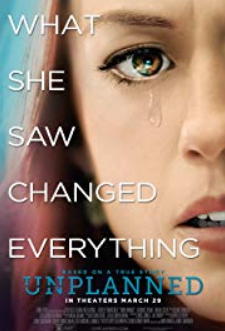 They have murdered a girl of 8 months and her mother. They set off an explosion using 6 kilos of plastic explosive, killing the mother, the wife of an official, and her child on the 30th of December, just a few days ago at a police station in Orito Putumayo, near the Equadorian border. Edit: why not, they're doing it everywhere else. It might have something to do with the Vatican's recent excommunication of those participating in an unauthorized consecration of Bishops chosen by the Communist Government. This is a very bad case of lay investiture and some things, at least, never change. If Catholic Princes could be hostile to the Church, why should Atheistic governments like China's be any different? The United Front wants to prevent the election of a bishop who from the underground community. Three underground apostolic administrators are under police control. 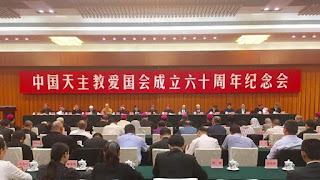 The Church of Tianshui launches a campaign of prayer for the liberation of their priests and faithful. Beijing (AsiaNews) - A group of priests and laity from the underground community of Tianshui (Gansu) were arrested by the security forces last weekend. Among them are the administrator of the underground diocese, Fr. 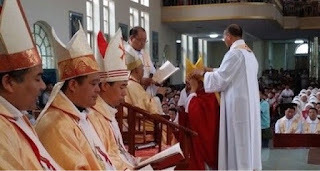 John Baptist Wang Ruohan; retired Bishop Casmir Wang Milu; Father John Wang Ruowang; as well as several other priests and dozens of parish lay leaders. Bishop Wang and the two fathers Wang are brothers. They are being held in different places and subjected to political sessions. 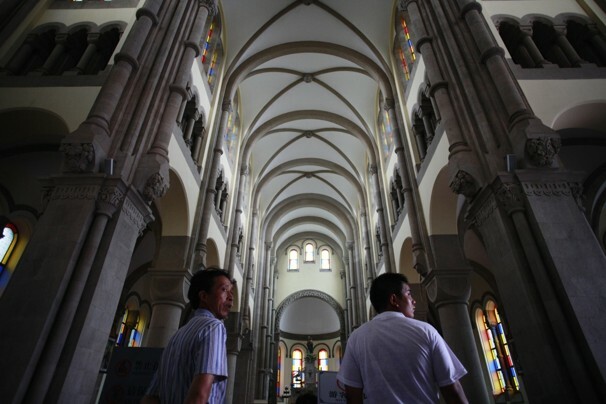 So far, the underground diocese of Tianshui had maintained a comfortable relationship with the police and government authorities. The two communities, the official and underground, have a total of 20 thousand faithful and 27 priests, 15 of which belong to the underground community. In 2003, Msgr. Wang Milu retired and the official bishop, Msgr. Jinglong Augustine Zhao died in 2004. The official administrator of the diocese is Fr. Zhao Jianzhang Woods, nephew of Bishop. Zhao. He was also nominated to become bishop.